I recently came across a YouTube video (thanks Eric H.!) that shows how to use descender rings and an easy wrap that makes a quick and secure adjustment without any complicated knots. Known to climbers as the Garda Hitch, this technique is used to haul gear upward, as it only slides in one direction. 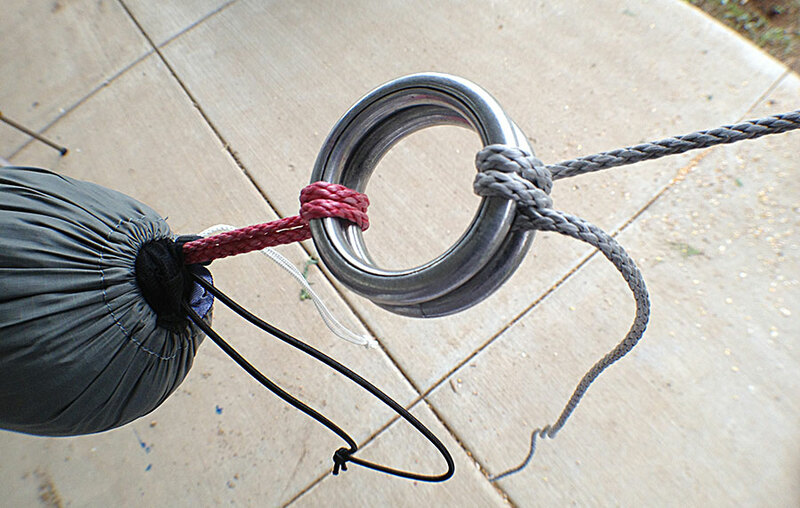 This hitch works by pinching the cord tightly as the wraps compress the rings together. I should note that some folks who have used this technique with rope have noted some wear on the rope with repeated use. Like any suspension system, it is always a good idea to inspect your suspension before every hang. This is just one technique in the ever growing hammock suspension tool box. I was surprised at how quick it was to create and adjust and how secure it held. The only modification I recommend to this method is to move the descender rings closer to the hammock so the rings double as a drip line. The other benefit is a lower overall weight since you can use less hardware. Use the following for each side of the hammock. Sew or tie eye loops on both ends of the webbing strap. On the line (amsteel), splice or tie an eye loop on one end, and leave the other end open. 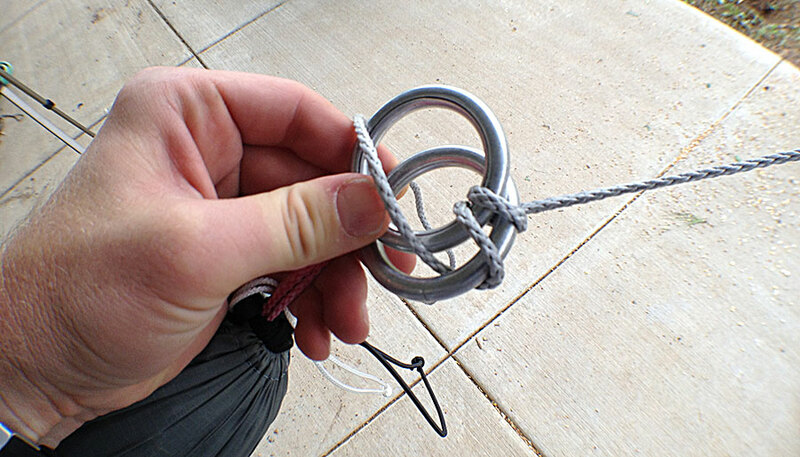 The continuous loop attaches to the end of the hammock (either through the end channel or around a whipped end). The descender rings are attached to the continuous loop. 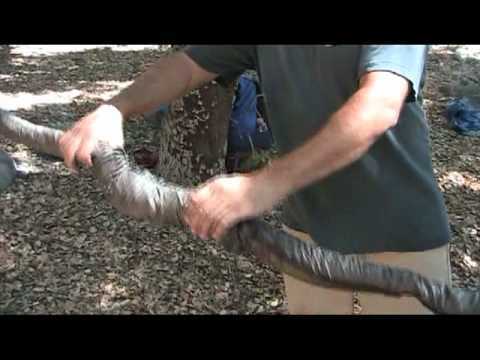 By having the descender rings near the end of the hammock, and therefor covered by the tarp, the rings act as a water break in case of water flowing down the suspension line. The rope is fed through the two loops and wrapped twice around both loops. A third wrap is made only around one loop. This allows you to easily tighten and adjust the suspension. To release the tension, slide the rings apart, and the rope will come loose. This looks 100x easier than whoopie slings. Yes! It uses less rope/line as well, so it could have a net loss in weight and bulk. However, be warned that this hitch can crush the fibers in Amsteel to where it can fail. At least this is what my friends have told me. I haven’t seen any data or heard of any formal tests, but I trust them. Please stay safe! You may have touched on this in the video but I didn’t see it (space cadet). But do you recommend any of the rings over the others? Do any work better? Or is it simply a matter of weight/preference? Further, how small can you go with the rings? I have whoopie slings on my eno doublenest, and they are fine but honestly I find them ever so slightly difficult to tighten satisfactorily. I don’t think that would be a problem with this system. Also it looks simpler. I like simple. I purposely didn’t recommend any one ring style over another, but was just showing the difference in weight. The other factor to consider is safety load strength. So long as the rings are rated to a satisfactory load limit, they should be fine. Lately I have been using a single SMC Decender ring hanging on the knot of the Marlin Spike Hitch. Adjustability would be easier with the Garth Hitch though, but, not by much time or effort. Beauty of both is able to adjust if trees are a shorter distance. Another great idea, need to buy 2 more SMC’s!! Just tried this with 1 in webbing. The garda hitch worked wonderfully well and was really easy to do. I have an ENO and took off the ‘biners and replaced them with the descender rings so I could adjust height and evenness easier. They held tight with the hitch and I was swinging and bouncing. Thank you! Thanks! I’m glad it is working! Straps should be just perfect with this hitch method. I will say it for Derek…hehe. Get the ones he is using, SMC Descender rings, couple bucks each. They don’t have a logo. SMC makes another ring that is fatter but smaller and those do not work. Omega ones dont work either. I have used Amsteel in this setup, and yah it compresses the fibers too much….it works, but not the same lifespan. You can just substitute 1 inch poly webbing for the Amsteel….it won’t be a Garda Hitch, just a simpler hitch that you can secure with a safety knot if you wish. What is the size of the smallest rings in the video-8 grams? Will they work on the Garda Hitch? What is the weight limit of these and where can I get them if they do work? The smallest were 1-inch steel rings from Handy Hammock in the UK. I believe they are rated over 400 lbs. I found similar rings at my local hardware store, but if you want these, I would contact Jason at Handy Hammock. Thanks. Might as well use less weight instead of more. Will Dynaglide work with the Garda Hitch or will it crush the fiber as with the Amsteel? I can’t say definitively. I’m actually going to do some strength testing on these and see what the failure point is, particularly on Amsteel. Welded 316 stainless steel o rings (4mm x 25mm) have a break strength of just over 1600lbs. go to a 5mm ring and you double the strength. You can buy these on ebay for about $1.50 each including shipping in lots of 5 or ten, or from any number of specialty shops. They are marine grade used in sailboats all the time for high tension dynamic loads. They stand up to serious abuse, don’t rust or pit, and are way lighter than SMC decenders. Mind you I wouldn’t repel using them, but perfect for hammocks. How about removing/loosening the rings? I pull my line to max tension/tightness. It looks like it would be tough to undo without having any slack to give back, yes? All you have to do is slide the rings in opposite directions. But now I must ask, why are you making your suspension so tight? What hammock are you using? Not only from a comfort standpoint, but from a safety standpoint, having your lines tight multiplies the weight and stress on them exponentially. Hey Derek I just ordered my first hammock and have been told the same thing as u about the double descending ring crush problem until I was told about the “single ring suspension” and use it like a truckers hitch kinda way. Any thoughts? Every suspension system is prone to wear. You just need to keep tabs on it as you inspect your gear. Single ring suspension works but I find it a hassle compared with other systems. Light and simple? Try the becket hitch. No hardware. I don’t know if you’ve tried them yet but I used my GM rings last night and they worked great. Hope this helps. I just got my SMC rings from whoopieslings.com great place to get them and I can’t wait to try them out! I noticed some wear on my Amsteel so I just bought some titan cord. It seems they recommend using a triple fishermans knot for making a loop which seems odd to me. My tree strap has a fixed loop which I larks headed the amsteel on. For the titan would it be reasonable to just use a double sheet bend or becket hitch to the tree strap loop then use the descender rings on the hammock side cl? Seems that would keep things clean and seems it would keep me off the ground.